Since launching in 2008, VTEL Jordan has diligently fulfilled its mission of becoming the country’s first true NextGeneration Network (NGN) operator, providing data, voice and related added value services to the wholesale, corporate and residential market. The company aims to become the optimal regional focal point, connecting the country to the rest of the region, and providing ample capacity to position Jordan as a truly attractive business destination. VTEL Jordan provides national and international connectivity infrastructure, which will enable it to fulfill its business objectives, including wholesale and retail connectivity, offering voice services and managed services. 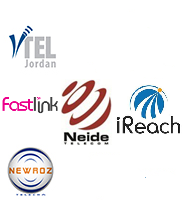 Is a joint venture between ALLAI NEWROZ Telecom and VTEL MEA, the company was established in 2007 to build and operate landline phones, fixed wireless, advanced ADSL, and EV-DO internet networks, in addition to transmission backbone networks in the Kurdistan region and international Gateway network. The company aims at becoming a premier regional telecommunications company through providing creative and new services and solutions, while utilising the latest technological developments. Established in 2011. Since its very beginning, Neide has set an ultimate goal to build up state-of-the-art telecom Fiber Optics infrastructure in Kurdistan region of Iraq.Neide saves no efforts to ease the life of its customers and delivers a wide-range of carrier services including voice, IPL, and IP transit and wide a la carte service portfolio. With international POPs deployed in the tier1 global Data Centers and 100+ national-wide POPs, Neide grants its partners the privilege to expand their service footprint to reach out to their customers anywhere. A private company owned by national and regional partners, aiming to revolutionize the industry of telecommunications and data services in Kurdistan by introducing state of the art 4G LTE data services into the country. In June 2013, "Fastlink" has entered the Kurdish Telecom and Data Market as the first 4G LTE operator in Iraq; and one of the very few 4G LTE operators in the Middle East. A private company owned by national and regional partners and established on May 1, 2012. Its major ambition is to serve the customer with highest quality at very reasonable prices creating a win-win situation for both the customer and the shareholder. iReach is an aspiring telecom service distribution company in the industry offering a full range of services and products, fixed lines, mobile to data services.